So despite not posting at all things still happened in the time since I opened that Weiss box. 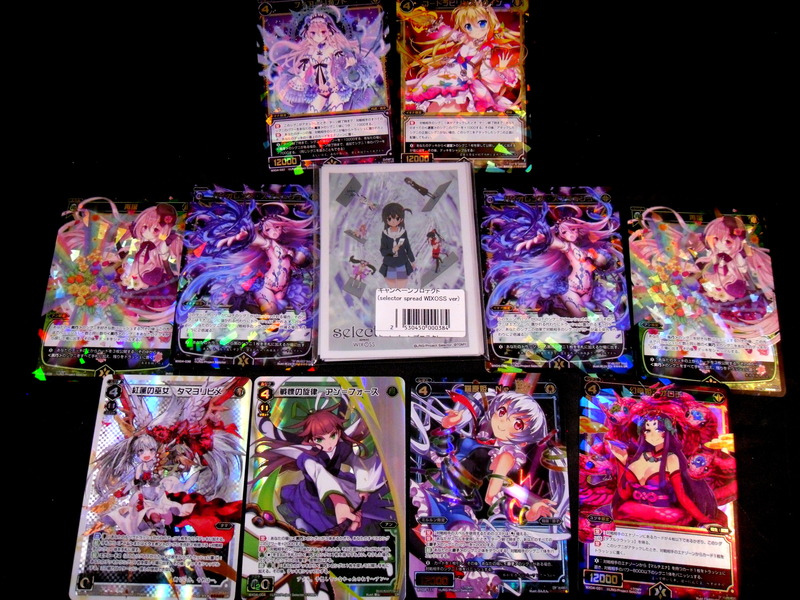 I found this Wixoss Lot on Ebay and bought it for $40. As ridiculous as that sounds this was a really good deal since the cards individually are really expensive to import. I took apart my Gruul deck. I know this may not seem like much, but my love of trading card games I’ve come to realize is based totally on building as many decks as feasibly possible. Each deck has a story. Each deck or build (bar a direct net-deck) is unique to its creator and in my opinion should be special to its owner. This Gruul deck for example was originally a Gruul EDH with Ruric Thar, the Unbowed as commander. However, Gruul (or aggro) was never my play style in EDH. 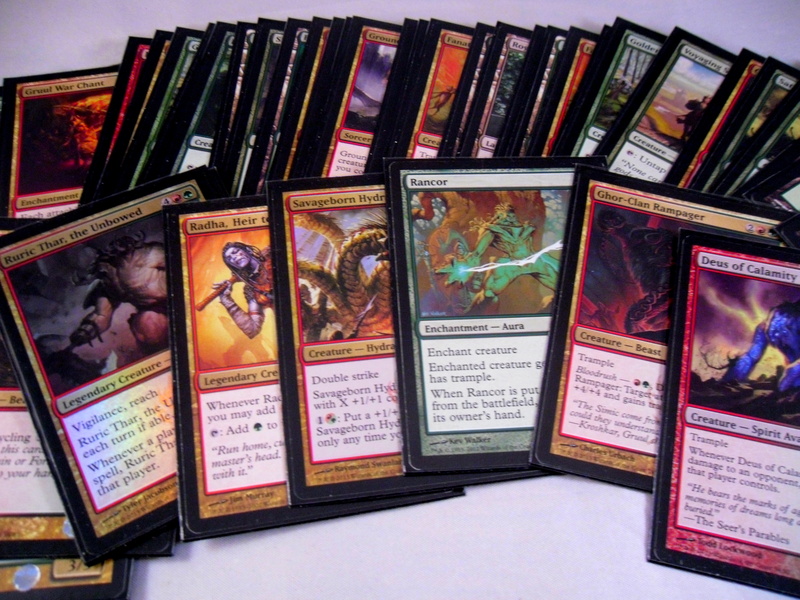 Instead, I got far more into my Superfriends deck so I downgraded it into a Legacy deck. However, I came to the realization that I had no positive memories of this deck (there is a very distinct chance that I never used it). I might convert it into a RG Tiny Leaders deck (with Radha, Heir to Keld as commander) in the future, but for now it’s just a source of mountains (I really just wanted to use the foil Savageborn Hydra I was given as a gift by a close friend a year ago in hindsight). 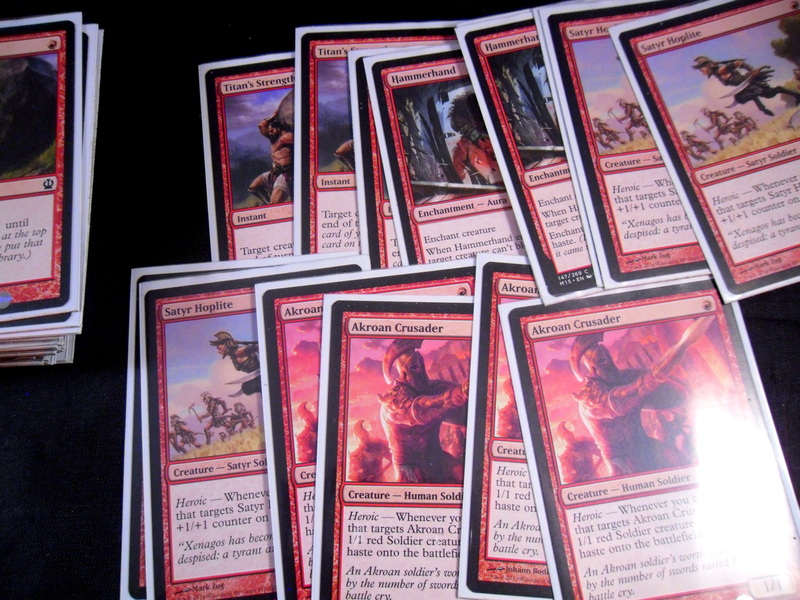 I’m taking this Theros block Red deck and converting it to a Pauper Red deck. Pauper is a MTGO format where you can construct a deck with only common cards. I think this is amazing as its literally the first thing other than draft/cube that makes any use of cards I literally watch people throw into the trash (commons) regularly. Also while I cut him long ago due to inconsistency Akroan Crusader is still my favorite card in Theros block (right next to Titan’s Strength). 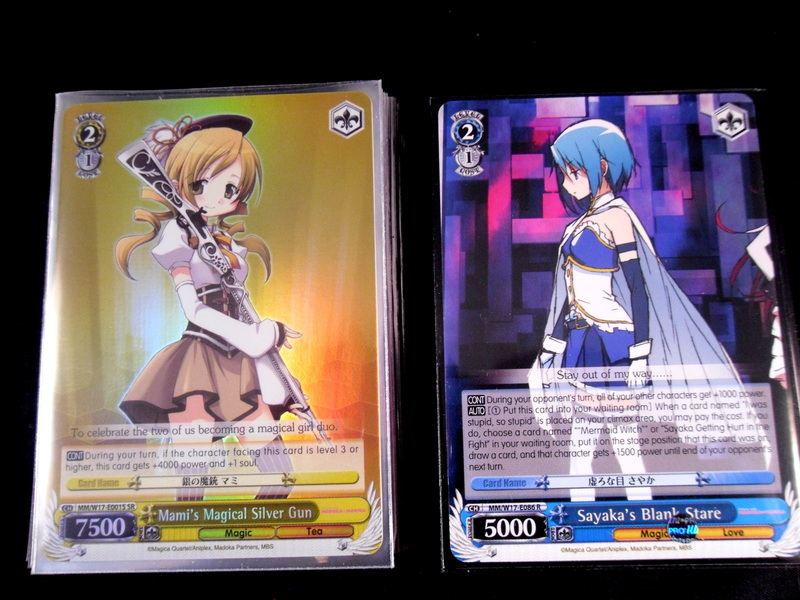 From that Weiss box I built a Mami Tomoe deck and… begrudgingly a Blue-Red Sayaka Miki deck (I pulled one Kyoko that was too cool to not splash red for). I have enough spare cards for a green Madoka-Homura deck, but I don’t have 50 spare MTG-sized sleeves at the moment (or more likely I haven’t found them in the abyss that is my room yet). Moving onto the yugioh tournament from yesterday. Due to train errors I already regret submitting to the internet I only arrived in time for the last 4 rounds of the tourney so to speak. With no chance to place I played fairly casually. This tournament was VERY original in its structure, but to not reveal it’s full mystic the only thing I will mention is that the rounds were 1 game matches (which sounds weird, but let’s move on). I somehow forgot how these darn things work outside of their trap card Ritual Beast Steeds (despite having a friend who plays the deck). In my infinite wisdom I tried to force out all of his Steeds until he ran out. Sadly I didn’t think that Ritual Beasts could OTK so I passed without recurring my Valk. My opponent revealed to me that they could OTK and that was that. He brought out his Baxia, Brightness of the Yang Zing and shuffled away my Nekroz guys, but I won in time somehow after that. And that was the Yugioh event. I wish I could say more, but there’s not much else to discuss. 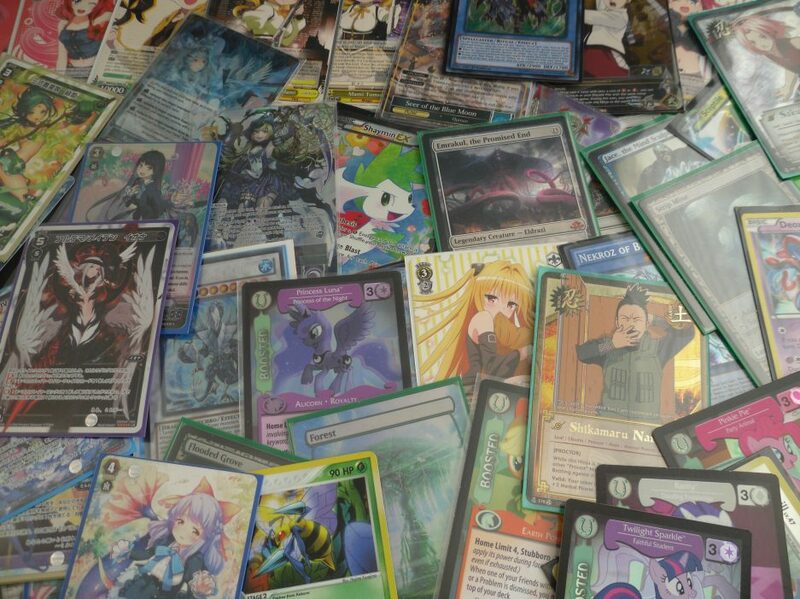 Oh yeah the cards shown were ones I traded for while at the event. 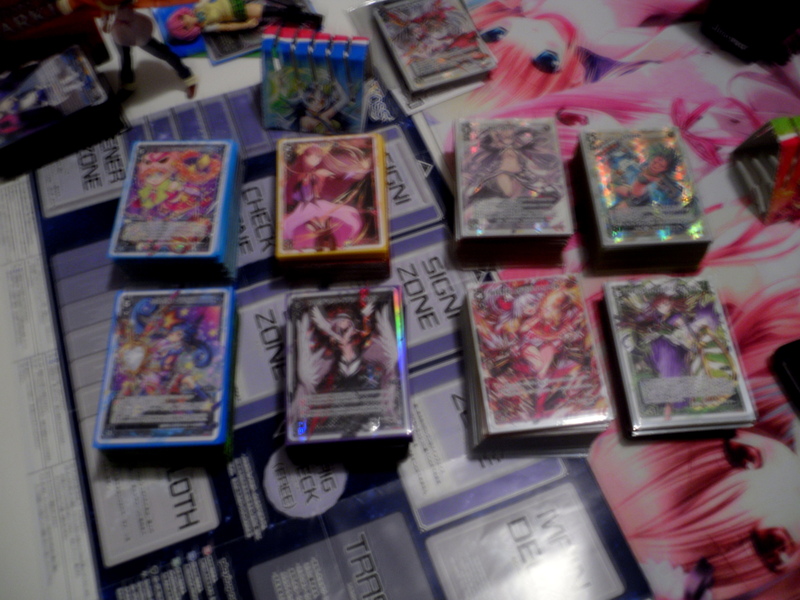 This sadly blurry picture shows the Wixoss decks built by myself and my friend Nyan (the one who brought me into Wixoss and also is ironically the friend mentioned quite possibly every time earlier in this post) over the last few months. I visited him today and we exchanged cards from the boxes we opened (more so I traded him the Green Anne cards I had for his Blue Mirurun cards. 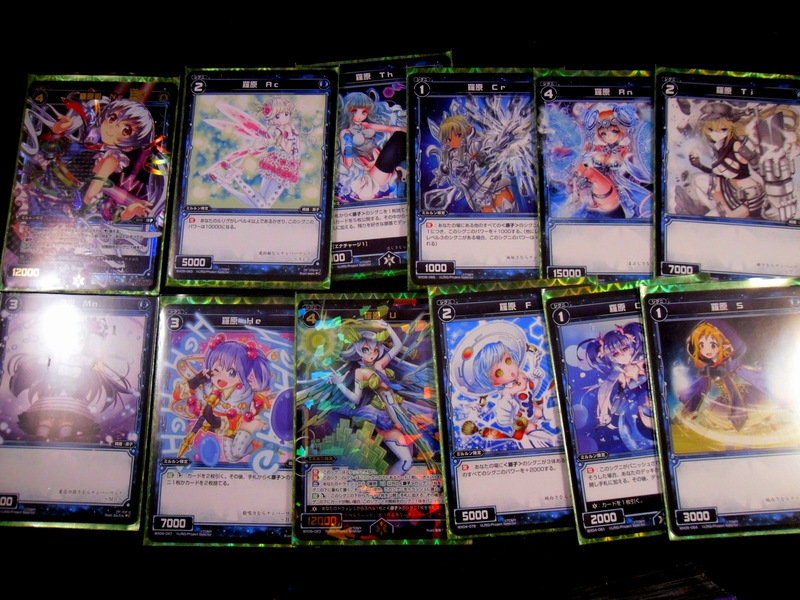 So from Box 4 I pulled Mirurun lv 1-3 and in his box 5 Nyan pulled 3 Mirurun lv 5s. Between the Anne cards I acquired from that Wixoss lot and the box we worked out a massive card exchange that bore each of us a new deck. 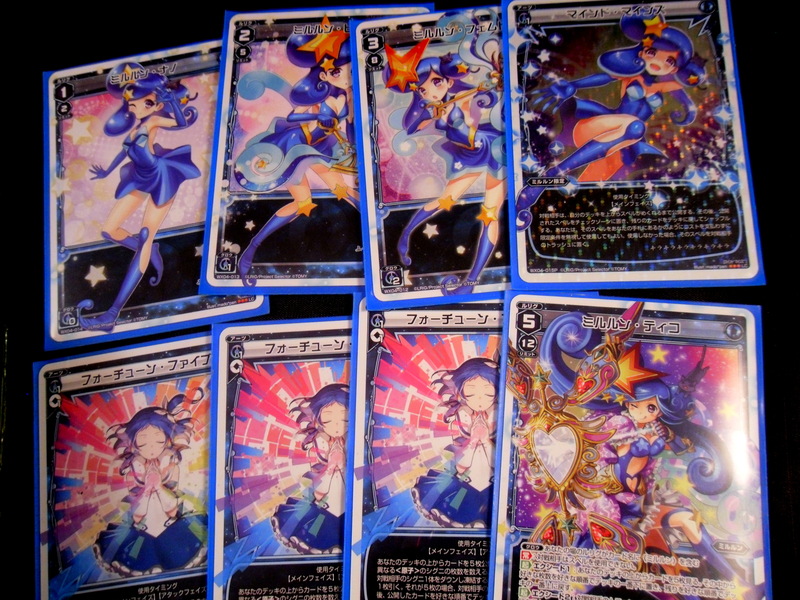 And thus I’m proud to add Mirurun to the long list of decks I’ve built. I still need to purchase a lv 0 and a lv 4, but those can be acquired at tcgrepublic. 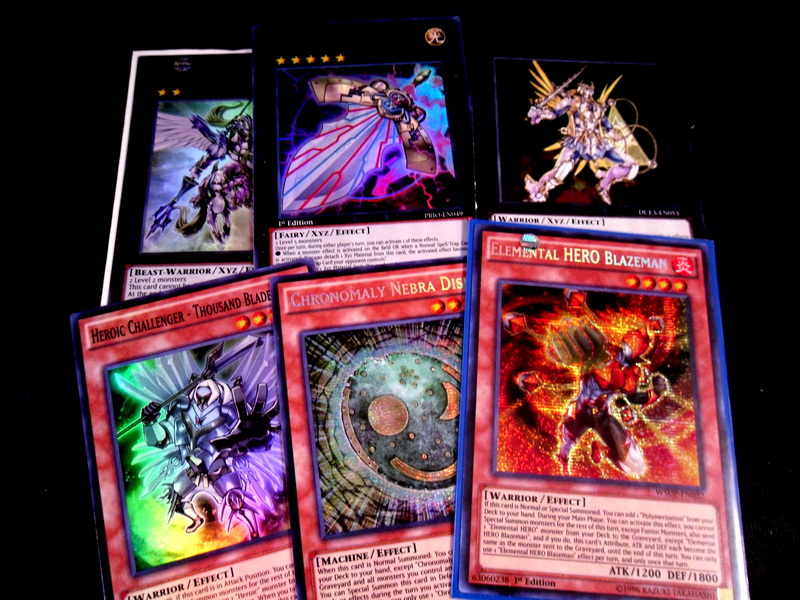 I’ve bought from that site before and I’d recommend it for getting Japanese single cards imported to the US. Nyan and I played out a series of almost matches (due to time constraints). However at the time of writing this I’m fairly exhausted so I’ll just explain each match-up in terms that a Magic player would understand (Wixoss -> Magic is much easier than Wixoss -> Yugioh sadly). Ok my eyes hurt. Probably a good time to call it quits. Thanks for reading my bizarre ramble and somehow tolerating my erratic reading schedule. Seriously, you’re awesome. Anyways, later.